Sagittaria guayanensis Kunth, Nov. Gen. et. Sp. Pl. 1: 250. 1816. Hook. f. l.c. 561; Ridley, Fl. Malay Penin. 4: 363. 1924; Kashyap, Lahore Dist. Fl. 255. 1936. A floating, fibrous-rooted herb with small rootstock. Leaves broadly ovate, membranous, indistinctly nerved, deeply cordate at the base, lobes and blade obtuse or rounded. Flowers white. Sepals appressed in fruit. 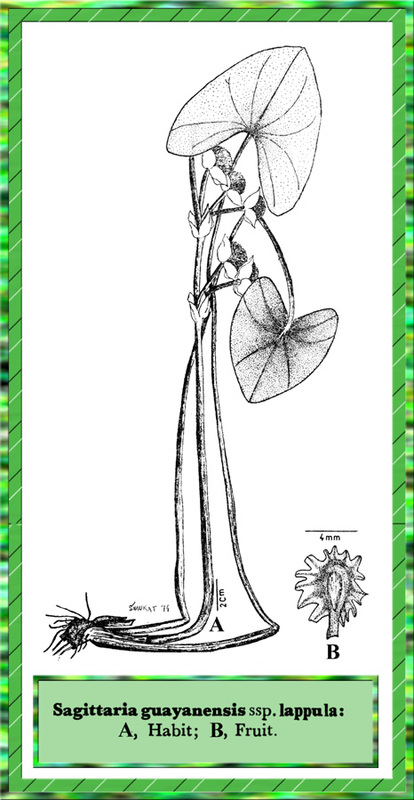 Stamens 6-15. Achenes plump or compressed, with shallowly or deeply crested rarely smooth wings. Type: Described from Colombia, Humboldt..
Distribution: Tropical America, tropical and subtropical Africa and Asia.